Sift the milk powder , all purpose flour and baking soda together into one bowl. Add required quantity of heavy cream or yogurt and knead the flour mixture to form soft and sticky dough . Cover the sticky dough and let it rest for 30 minutes. After 30 minutes you will see the dough is of proper consistency. While making balls if you feel dough getting dry, add more milk and knead well. Meanwhile combine sugar and water into sauce pan. Once the syrup starts to boil, add few drops of lemon to avoid crystallization and then cook it on the medium flame till the syrup thickens. Then add cardamom powder and rose essence. Mix well and keep the syrup aside. Divide the dough into small 28 equal sized balls. Smooth out the balls by applying little ghee on to your palms. Heat the oil into the pan and and fry these balls on low flame till they are dark golden in color. 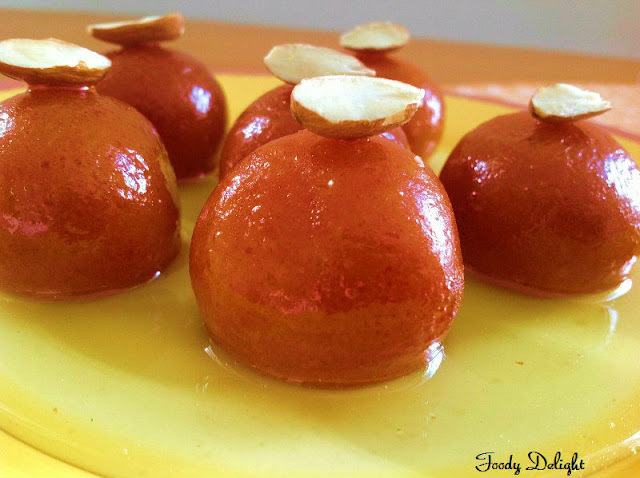 Then soak the fried balls into sugar syrup for atleast 30 minutes and once the jamuns absorbs the syrup, they become more soft and just melts into your mouth. 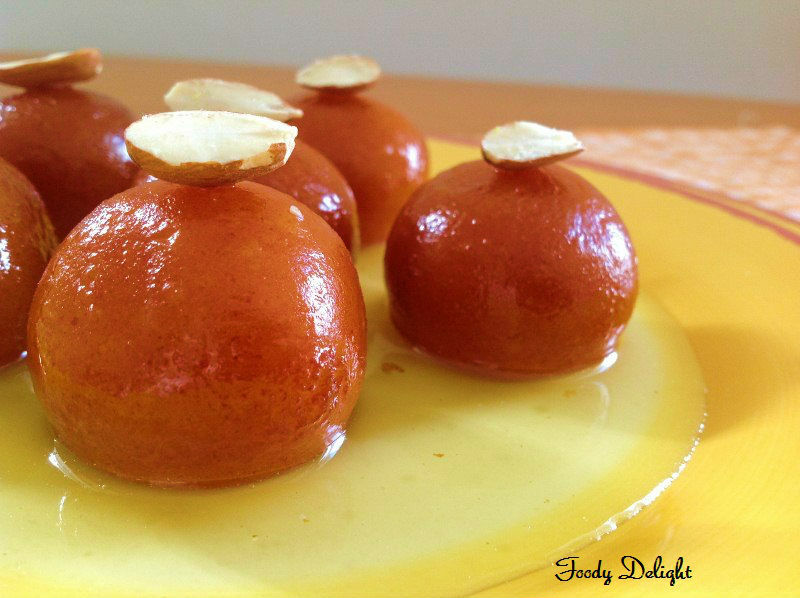 You can also served theGulab Jamuns with ice cream. So do try it and let me know your comments. Yummy Gulab jamuns.. Very inviting. 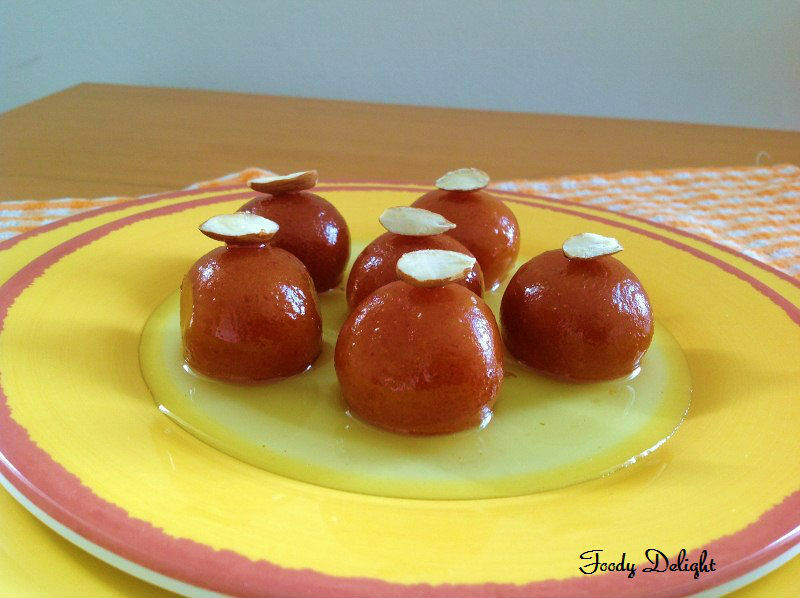 Nice clicks too..
Spongy and juicy jamuns tempts me a lot. WOW!!! Looks so soft and delicious. Jamuns r lukg awesome n soft..my family's most fav. 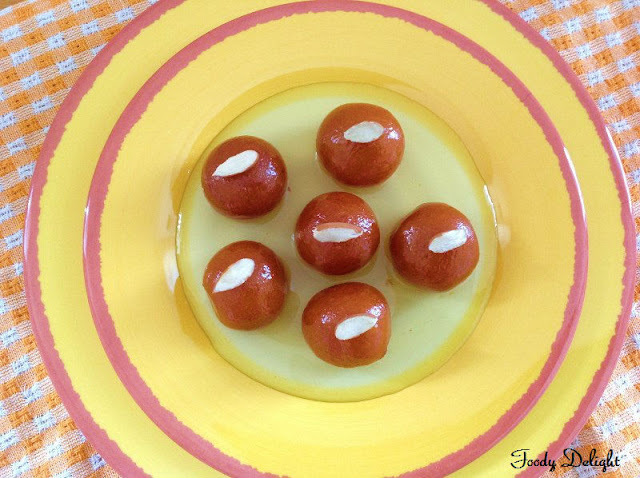 sweet :)..i always make them using MTR mix..once got a similar recipe as ur's but gulab jamuns didn't soak d syrup :( n thy were dry from inside..gonna try ur recipe soon..thnx dear for sharing. Thats good. You need to soak the jamuns into warm syrup. i did so my frnd..but still thy were little dry from inside...i soaked them for almost 6 hrs..now i think its may b bcoz of d milk powdr i use(Nido)..will try with other brand..hope it turns gud nxt time..thnx for ur reply.